On April 15, 2015 tens of thousands people joined together in what the Guardian newspaper called the “largest protest by low wage workers in US history.” Marches and rallies were held at dozens of cities, with solidarity actions by garment worked in Bangladesh. 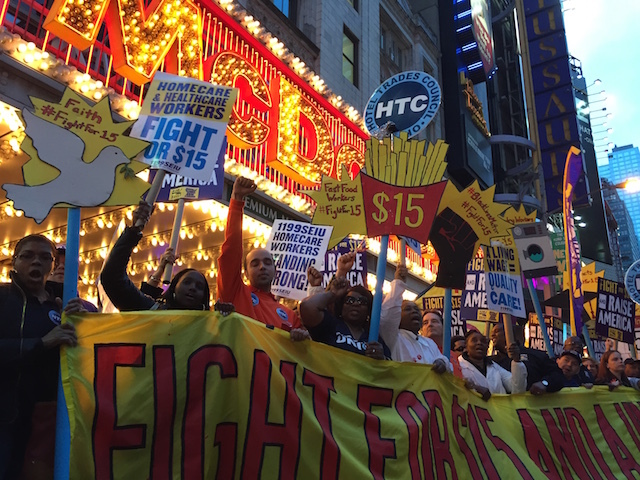 Together, they sent a clear message: It’s time for $15, fair pay, and union rights. The flagship action was a march of tens of thousands of people in New York City. As part of People's Climate Arts, I designed the visual strategy for the march, which included a giant number 15 that could be carried at the front of the march, along with $15 dollar signs where the faces of the presidents were replaced by real life low wage workers who carried them. On the day of the action, I was tasked with marshalling the front of the march.